A bustling hub of activity along the coast of Cape Town, flanked by the Atlantic Ocean and the gorgeous mountains of the Mother City, Sea Point is part of the greater area of the Atlantic Seaboard, with breath-taking views of Table Mountain, Signal Hill, Lion’s Head and Devil’s Peak, as these hills and mountains loom over the busy streets and beachfront below. Sea Point is situated between Mouille Point, Green Point, and Bantry Bay. It showcases an eclectic combination of homes, people, languages, cultures, colours and creeds. As such, it is an apt representation of the many faces of this Rainbow Nation, as South Africa is affectionately known. The streets are lined with quirky boutiques, galleries, luxury car showrooms, coffee cafés, cocktail bars, clubs, businesses and a huge selection of restaurants. It is always cosmopolitan, vibey and inviting. The suburb of Sea Point was originally established when French aristocrats settled on the slopes of Signal Hill in 1739. Almost 40 years later, Sam Wallis stationed his men in this area to keep them away from the epidemic of smallpox that had overtaken other parts of Cape Town. By the 1800’s, it had become a formal suburb, merging with the neighbouring area of Green Point. The Sea Point Promenade is awesome to stroll along, with wide paved areas as well as gorgeous stretches of green grass, and endless views of the ocean. The promenade has functional outdoor gym equipment, playgrounds for the little ones, and public exhibitions of various types of art. Locals and visitors alike explore the promenade on foot, bicycles, rollerblades, or skate boards. The luxury apartments that line the Sea Point Promenade are popular amongst young up-and-coming couples and make for stunning holiday accommodation. The houses of Sea Point are close to one another, creating picturesque suburbs with a distinctive colonial charm. Some of the homes are national monuments, protecting them from major renovations and preserving their historical nature. These homes are adjacent to and among trendy stores and eateries, making this a hive of activity for locals and tourists. The coastline here is not safe for swimming, as there are rough seas and rocky shores. However, it provides an exquisite backdrop, and safe swimming beaches are only a short drive away from Sea Point. These include the stunning Clifton beaches and scenic Camps Bay Beach. Llandudno is a little further away, but its unique beauty is well worth the drive. 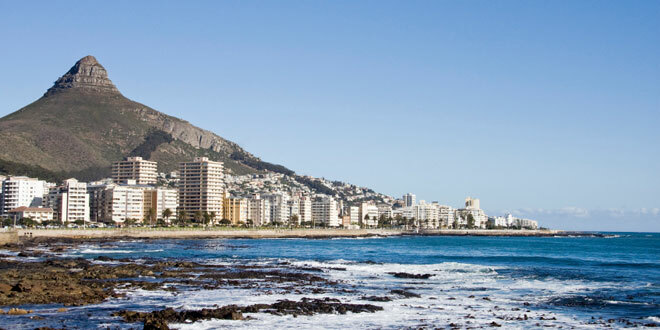 The Victoria & Alfred Waterfront is also part of the Atlantic Seaboard, and a close neighbour to Sea Point. This is one of South Africa’s top attractions, and promises the world-class shopping and dining experience of a lifetime. Hundreds of fabulous outlets that stock many of the top international labels are part of the Waterfront. It also includes museums and galleries, and is the base from which the ferries depart for tours to Robben Island.